An earthquake with a preliminary magnitude of 4.7 rocked Monterey County Monday morning, according to the USGS. The quake, which struck at 11:31 a.m., was centered about 13 miles northeast of the city of Gonzales, according to the USGS. 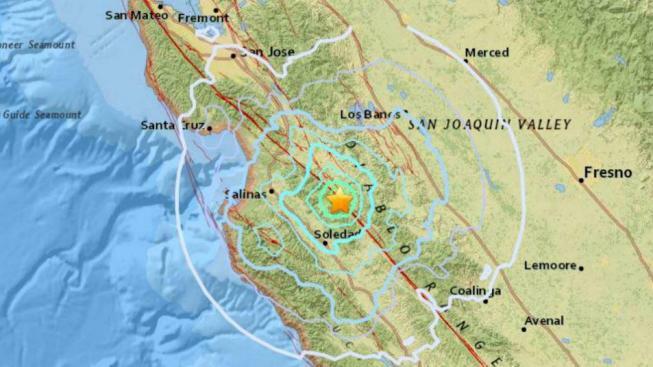 People in Bay Area cities such as San Jose, San Mateo, Alameda and San Francisco reported feeling shaking. The USGS recorded at least five aftershocks of magnitude 2.5 or stronger in the area around the epicenter later Monday, the strongest registering 2.8 at 8:17 p.m.
Track the latest earthquake information using NBC Bay Area's quake map.